October is typically thought of as a cooling off period, both in the weather and in real estate. This past month, in addition to the still summery weather—we were also seeing a sizzlingly competitive housing market at a time when things are usually cooling off for the fall. “With not enough homes on the market to meet the high demand, homes are selling 14% faster than a year ago even though prices are as high as they’ve ever been. Prices are on the rise. The Median price for a home in Monmouth County in October of 2016 was 450,000. Here we are a year later and the median price is now up to $ 499k. That means prices are continuing to rise. The same is true in Ocean County, but prices there are only up by 10 thousand dollars. While prices are going up the average date on market is going down. Date on market is the number of days a home is on the market. It’s down from 67 in 2016 to 58 in 2017. The same is true in Ocean county where the average Date on Market went down from 78 to 67. Next we look at the Absorption rate. That tells us what type of market it is. Remember, the absorption rate is calculated by dividing the number of sales in a given month by the number of available homes for sale. It is the inverse of months of supply. For example, if there are 100 condos listed for sale in a certain area, and 10 condos sold over the last month, the absorption rate is 10/100=10%. In Monmouth County the absorption rate for October of 2016 was 5.68 and it’s now down to 4.23. That means there is only a 4 month supply of homes on the market. Inventory is low and it is still a seller’s market. The same is true in Ocean County where the absorption rate is down to 4.96 from 6.27. Finally, let’s take a look at some stats. Starting in Monmouth County. We are comparing numbers from October 2016 to October 2017. This past month 738 homes were sold which is higher than last year. We have 896 pending listings which is up almost 24% from 2016. There are currently 3416 active listings which is down 17% from 2016. Again, there is a lack of inventory which contributes to the seller’s market and the higher prices. 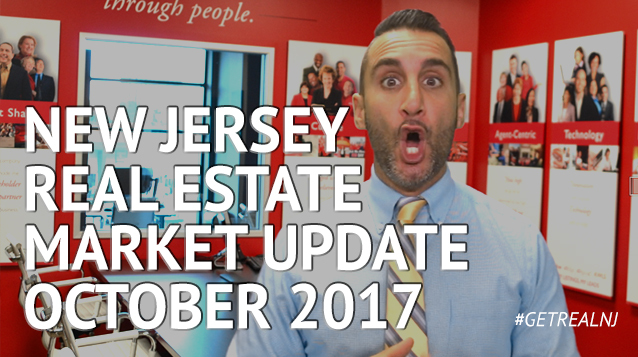 And we only had 4 new listings in October 2017 then we had this time last year. In Ocean County, sold homes went up 5% from 2016. There are 996 pending listings ready for closing and the number of active listings went down 13% from 5,367 to 4,675. The good news for buyers in Ocean County is the number of new listings last month, which is up 6.7% with 1,328 new listings and an average sales price of 284k. If you are thinking of selling, now is a great time. With low inventory and higher prices, now may be a great time for you to make a profit on any equity you have built. If you are interested to know your home’s value, give me a call for a no obligation home valuation report. I will be back next month with another market update. My name is Michael Falgares from Keller Williams’s Get Real Group. Thanks for watching.